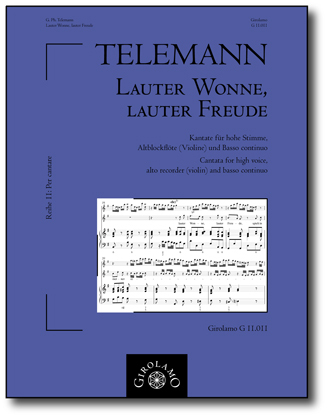 The cantata Lauter Wonne, lauter Freude was written for the fourth Sunday in Advent. In the TVWV the cantata is recorded under the number 1:1040.1) The text is by Matthäus Arnold Wilkens (1691–1745)2) and refers mainly to the 4th chapter of St. Paul’s Epistle to the Philippians, verse 4 to 9. The notation (including keys and accidentals etc.) has been modernised according to modern customary rules. The text on the other hand has deliberately not been modernised. Additions and corrections made by the editor are indicated directly in the music or in foot notes. Very few errors have been corrected discreetly. According to the master copy in the first aria, the 2nd half of bar 7 up to the 1st half of bar 17 has repeat marks. The repeat has been written out in this edition to make page turning in the score more convenient. The passage marked with “Vi-de” can be omitted if required. spielt in meiner regen Brust. Gott allein ist seine Lust. der Vorwurf ihrer Lust entspringen. ja oft so plötzlich weicht! und dennoch lauter Gift in allen Blättern hegt! dem bringt sein Freuen lauter Leid. die mit Bestand und Seligkeit verbunden. und was ihm ewig wohl gefällt. stir in my turbulent breast. for God only is its desire. in seeking revenge of his enemies. the reproach of their desires must arise. and often so suddenly recede! and yet nurtures poison in all the leaves! will rejoice solely in suffering. that is united with continuity and salvation.